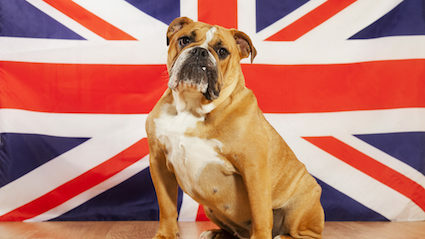 THERESA May will trigger Article 50 by strapping a letter to a no-nonsense bulldog that will fly to Brussels in a Spitfire. Trevor the bulldog will take off from Seething Airfield in Norfolk, one of the most important RAF bases during the Battle of Britain. Before being placed in the aircraft he will be stroked by Dame Vera Lynn and a member of the public who won a raffle at a lovely village fete. Trevor will parachute out of the Spitfire as it passes over the European Commission headquarters, before waddling heroically into the building in search of commission president Jean-Claude Juncker. Trevor has been trained to find Juncker by sniffing a napkin that Theresa May stole from the lunch table at the most recent EU summit. He will bark at Juncker until the bureaucrat takes the letter from a specially made leather pouch. Trevor will then urinate for a full 30 seconds on the incredibly plush carpet before being transported back to London in a 1958 Morris Minor Traveller and one of the little ships that took part in the Dunkirk evacuation. 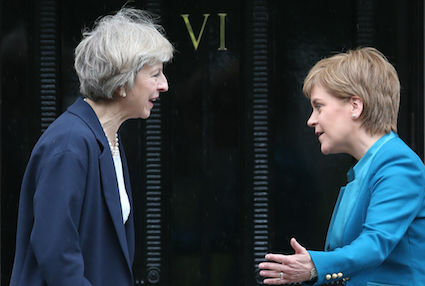 The prime minister said that she understands perfectly that Scotland is afraid to try new things, but they should be brave and give it a little go. She added: “How do they know they won’t like the Brexit? “I might have expected this of Wales, they’ve always been faddy, but for that little country to sit there, lips pursed, refusing to even have a tiny bit of the Brexit is ridiculous. May added: “Shall I pretend that the Brexit is an aeroplane coming into land?